Small glass bottle with glass stopper for morphine, with traces remaining. 62 mm x 20 mm, 23g. Handwritten label reads, 'SOL: MORPH: MURI:' Unknown maker, probably English, c. 1840. 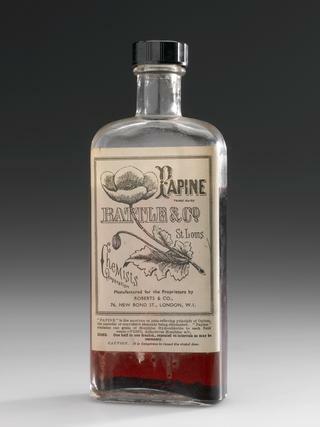 Amber glass bottle with cork stopper one-third full of 'Anodyne Pine Expectorant'. 203 mm x 72 mm diameter, 418 g. Made by Parke, Davis and Co., London, early twentieth century. Small glass phial with cork stopper containing 4 brown pills ' Tdrocl. Morfina', presumed to be a morphine preparation. 38 mm x 8 mm diameter, 2 g. Prepared by Fratelli Zanelli, Bologna, Gorga collection, Italian, 1851-1910. Wooden chest specially made to hold 50 stoppered glass phials of tablets, 1 missing. Chest: 127 mm x 233 mm x 127 mm; Phials: 103 mm x 15 mm diameter. Substances within phials include aspirin, quinine, rhubarb, tannic acid, mercurous chloride, morphine, Dover's Powder (ipecac and opium), ipecacuanha and phenazone. Unknown maker, for military use, German, 1900-1918. 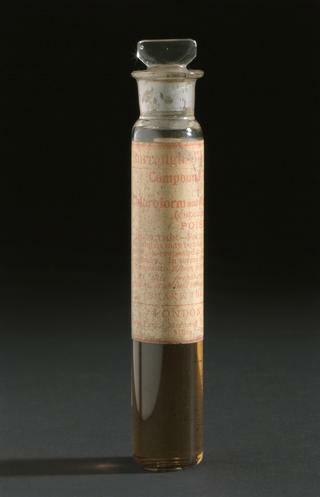 Glass tube of "Hypoderm" (morphine sulphate, atropine sulphate and hydrobromide) with cork stopper. 50 mm x 6 mm diameter, 1g. Produced by Allen and Hanburys Ltd., English, early 20th century. Glass tube of Hypoderm tablets. Hypodermic syringe, glass and silver, in leatherette case, with 2 needles and 2 glass bottles with ground stoppers containing traces of Ergotin and Morphine, respectively. Overall: 42 mm x 118 mm x 22 mm, 62 g. By C. Wright and Co., 108 New Bond Street, London, England, 1871-1910. Octagonal clear glass bottle with paper covered stopper and metal cover, full of 'Liquore Anodino' (contains morphine). 63 mm x 28 mm x 28 mm, 60g. Unknown maker, Italian, 1750-1850. 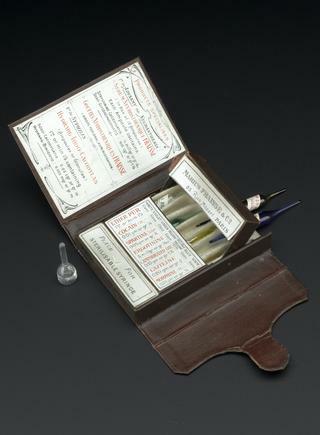 Leather hypodermic syringe kit with purple silk and velvet lining, containing three four opaque glass phials for atropine, ergotine, pilocarpine and morphia, with trace contents, needles and syringe missing. Case: 24 mm x 84 mm x 87 mm; Phials: 69 mm x 13 mm diameter. Made by S. Maw Son & Thompson, English, 1870-1905. Pocket dispensary with metal tabs for various drugs (including morphine and opium), tinned steel, with traces remaining. 67 mm x 87 mm x 17 mm, 116 g. Unknown maker, English, 1880-1920. 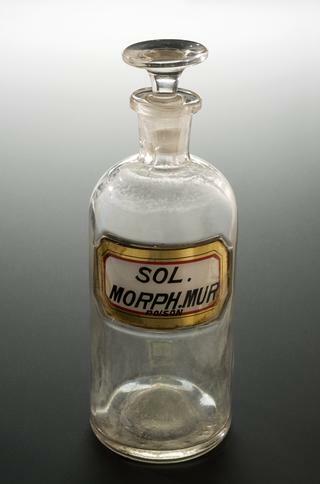 Small bottle for morphia (morphine) bottle with ground glass stopper in wooden case with traces remaining. 78 mm x 22 mm diameter, 22 g. Unknown maker, possibly English, 1851 to 1920. 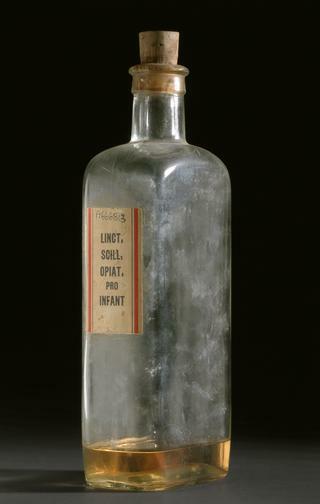 Glass bottle for chalk and morphine tincture, with trace elements. Measures 240 mm height, x 78 mm diameter, 410g. Inscribed on paper label, printed 'TR CHALK [...]MORPH/N.F. TYLER, .../87 ABINGDON ROAD, KENSINGTON, W.8/...'. 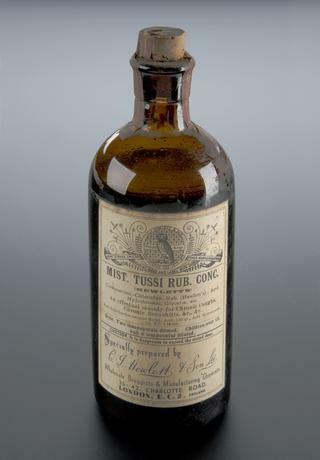 From N. F. Tyler's Chemist's Shop, 87 Abingdon Road, Kensington, London, W8, England.